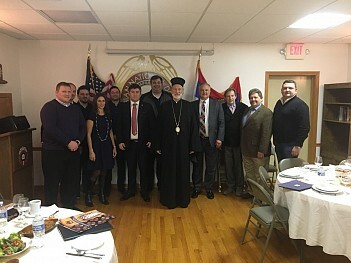 With the blessings of the Episcopal Council and Central Council of the Serbian Orthodox Dioceses in the United States of America, His Grace Bishop Irinej of Eastern America convened a coordinating meeting of Serbian-American organizations and young leaders on Saturday, December 1st, to begin planning for regular Serbian American Leadership Conferences in Washington, DC, following the successful commemoration of the centennial of Woodrow Wilson’s Day of Prayer for Serbia this past July. The inaugural gathering was graciously hosted by the Serbian National Defense Council of America whose president, Nebojsa Zivkovic, warmly welcomed the attendees, emphasized the need for closer cooperation and coordination among organizations and leaders, and introduced Bishop Irinej. Bishop Irinej drew upon his vast experience as representative of the Church both in Washington, DC, and in other bilateral and multilateral fora throughout his priestly and episcopal ministry, to explain the unique potential that a common witness of the Church and our Diaspora organizations in the United States can provide especially in this time of increasing uncertainty in Serbia and the region. The Serbian American Leadership Conferences would serve a coordinating role to establish frequent contacts and joint activities with the Serbian American Congressional Caucus and other Members of Congress, the Administration and NGOs dedicated to religious freedom and human rights, but also allowing our national and regional organizations and groups from throughout the U.S. to work together on issues of shared concern. SALC would also institutionalize the annual commemoration of Woodrow Wilson’s National Day of Prayer for Serbia every year at the US Capitol together with the Serbian American Congressional Caucus. 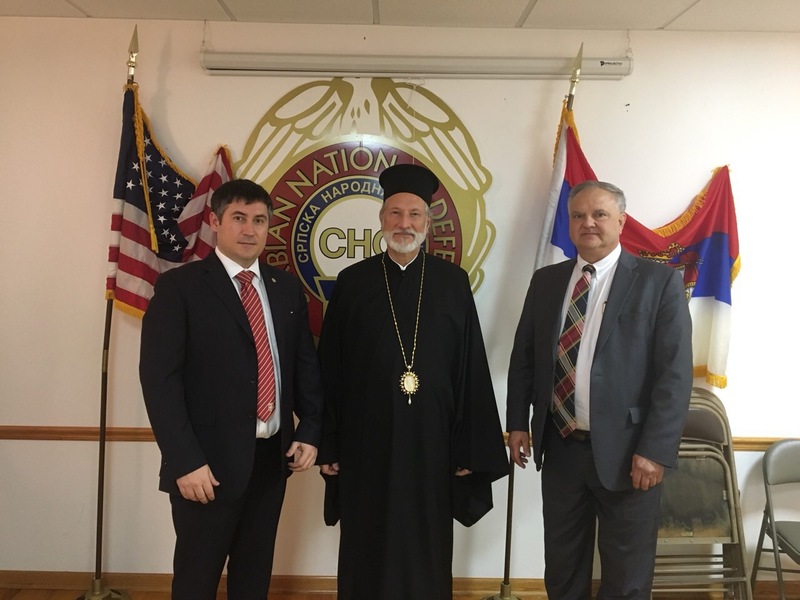 In addition to the Serbian National Defense Council of America, organizations participating in the initial gathering included the Serb National Federation represented by President John Martich and Vice-President Hon. Ted Potkonjak, the Serbian Bar Association of America represented by President Marko Duric and Dana Zivkovich, representatives of the Diocese of New Gracanica and Midwestern America, the congregations in Miami and Washington, DC, and young leaders from Indiana and Illinois. More information will be made available soon for organizations and individuals interested in participating in the work of SALC in 2019. У суботу 1. децембра 2018.г у просторијама СНО у Чикагу одржан је скуп више организација заинтересованих за сарадњу и позитиван приказ Српске заједнице у Америци. Њ.П Владика Иринеј водио је састанак на коме су поред представника СНО и Српског Народног Савеза из Питсбурга присуствовали чланови Српско Америчке Адвокатске Коморе као и појединци заинтересовани за формирање одбора који би руководио САЛЦ (SALC - Serbian American Leadership Conference) у Вашингтону. Заједнички закључак је да српска заједница у Америци треба и мора да буде присутнија у Вашингтону као и у контактима са америчким сенаторима и конгресменима како би предочила проблеме и ставове српске заједнице како у Америци тако и ван ње. За почетак, сваке године обележавао би се дан када се српска застава вијорила изнад Беле Куће, а временом би се радило и на оснивању канцеларије САЛЦ. Даљи рад и напредак САЛЦ биће благовремено објављен.